No single coherent conceptual framework organizes the state's overall revenue collection function. The APT tax system seeks to provide such a framework by extending the logic of normative tax principles to all available tax instruments. The APT tax encompasses all prior taxes and subsumes them in the rubric of a singular tax structure. Revenue neutrality, base broadening, rate reduction, simplicity, transparency, equity, allocative efficiency and minimization of administrative and compliance costs are the principles that have guided the design of this apt new tax system. costs must be weighted against the benefits obtained by replacing the current tax system. Technological innovations in finance and communications have internationalized financial activity and created a virtual worldwide commerce. Institututional adaptations to these radical changes may ultimately require some form of global financial architecture. Today’s taxation schemes are based on personal incomes, corporate profits and expenditures, generated within national borders. However, massive reductions in transaction costs render these borders increasingly porous. Capital mobility, transfer pricing, off shore tax havens, tax competition, Internet commerce and the creation of global equity exchanges make it more and more difficult to identify and assess the national origins of income and profits and to tax them (see, for instance, The Economist, ‘The mystery of the vanishing taxpayer’, January 29, 2000). Taxation on a global scale offers a technological solution, but the politics of taxation and fiscal sovereignty remains an essentially national matter. At the national level, there is deep dissatisfaction with existing tax systems. They are viewed as overly complex, opaque, inefficient, inequitable, and costly to administer. The United States considers flat rate consumption taxation. Europe debates the wisdom of ‘fiscal harmonization’ and Japan contemplates radical institutional changes including major tax reforms. This reexamination of fiscal institutions should include consideration of replacing existing tax systems with a flat rate tax on all transactions as a means of simplifying and improving taxation in the 21st century. The politics of tax reform must proceed at the national level but there are great network externalities to be reaped from the coordination of similar tax structures in different countries. This paper proposes to eliminate the present system of personal and corporate income taxes, sales, excise, capital gains, gift and estate taxes, and to replace them with a single comprehensive revenue neutral Automated Payment Transaction (APT) tax that is simple, transparent, efficient and equitable. The author is under no illusion that such a radical proposal will be readily implemented. Rather, it is hoped that the proposal will spark international debate and research on a fresh set of issues in public finance and monetary economics. The foundations of the APT tax proposal involve simplification, base broadening, reductions in marginal tax rates, the elimination of tax and information returns and the automatic assessment and collection of tax revenues at payment source. The APT tax proposes to extend the tax base from income and consumption to all transactions, to eliminate tax expenditures in favor of direct government expenditures, and to rely on the skewness of the tax base rather than on the progressivity of the tax rate structure to insure equity. The APT tax can be viewed as a public brokerage fee accessed by the government to pay for the provision, maintenance and use of the monetary, legal, and political institutions that facilitate and protect market trade and commerce. The new tax system is designed solely to raise government revenue. We intentionally avoid the contentious issue of how large the government “should be” by requiring a revenue neutral tax that raises the same amount of revenue as is raised by the system of taxes that the APT tax is intended to replace. Simplicity is achieved by requiring that all final party transactions be taxed at the same ad valorem rate. Since every transaction must be settled by some means of final payment, taxes are routinely assessed and collected at source through the electronic technology of the automated banking/payment clearing system at the moment that economic exchange is evidenced by final payment. This automatic collection feature eliminates the need for individuals and firms to file tax and information returns. Real time tax collection at source of payment applies to all types of transactions, thereby reducing administration and compliance costs as well as opportunities for tax evasion. The simplicity of this apt tax derives from its flat rate structure applied to all final party transactions evidenced by payment with a final medium of exchange such as currency or a debit or credit to a transaction account. By eliminating all deductions, exemptions and implicit tax expenditures, the APT tax replaces the complexity and opacity of the current system with comprehensibility and transparency. Elimination of tax expenditures and special interest loopholes reduce incentives for rent seeking tax-lobbying behavior while clarifying tax incidence. The political burden of determining the allocation and distribution of government spending shifts entirely to the more transparent budget expenditure process. The variety of existing tax instruments, modes of collection, and the complexity of tax law have created an opaque tax system in which the determination of effective tax incidence is virtually impossible. Stiglitz (1986) suggests that politicians prefer such ambiguities “precisely because it is not clear who pays the tax." Informed private and public decisions concerning both the size of government expenditures and their distribution require a transparent tax system that fairly establishes each citizen's total tax burden. The APT tax collection system provides greater transparency automatically since individuals and firms need only consult the total debits to their tax payment accounts (TPA) to determine their total tax payments. By greatly broadening the current tax base, the APT tax permits a significant reduction in the marginal tax rates on currently taxed incomes and expenditures. It therefore recaptures many of the deadweight efficiency losses of the current tax system. Most important among these is a reduction in marginal tax rates on labor income that now accounts for roughly 75 percent of national income. The requirement of revenue neutrality implies that many utility producing voluntary transactions (primarily exchanges of financial property rights) that are presently untaxed, will now be taxed. These new tax wedges will induce new allocation distortions and distribution consequences that require further evaluation. The equity and fairness of the APT tax system depend upon its tax base, which is more highly skewed than the conventional income or consumption tax base (see Section 4). The wealthiest portion of the population executes a disproportionate share of total transactions whereas the percent of transactions undertaken by the poorest members of society is very small relative to their proportion in the population. The equity characteristics of the APT tax are determined by the skewness of the transaction tax base, rather than through progressivity in the tax rate structure. Because the APT tax is revenue neutral, it must, by definition, transfer the same amount of real resources from the public to the government, as does the present tax system. However, if this resource transfer can be undertaken at substantially reduced cost, without imposing greater net efficiency losses, it is welfare enhancing. Indeed we will argue that the replacement of the current tax system will eliminate larger distortions than will be introduced by the new APT system. The intuition behind this conjecture relies on the fact that base broadening permits a corresponding reduction in the marginal tax rates imposed on currently taxed transactions. Excess burdens fall non-linearly with reductions in the marginal tax rates on these presently heavily taxed transactions. These gains are of course partially offset by the introduction of tax rates on transactions that previously escaped taxation. The APT tax radically alters the composition of the transactions that make up the tax base. The current system primarily taxes transactions associated with income production and consumption. The largest portion of the APT tax base consists of wealth transferring and wealth redistributing transactions. The introduction of marginal tax rates on these latter activities will certainly have allocation consequences. By creating a tax wedge between the bid and ask prices of financial assets, the APT tax provides incentives to lengthen the average holding period of financial instruments. It will also increase the costs of hedging risk, of undertaking arbitrage and of speculating in financial markets. But as will be developed below, at least some of these allocation effects may actually be socially desirable, particularly where some of the newly taxed activities can be shown to produce negative externalities that can result from excessive volatility (see section 6.4. for a discussion). The net efficiency of the APT tax proposal must be evaluated by comparing its relative benefits and costs. Ballard, Shoven and Whalley (1985) employing computational general equilibrium models to determine the welfare effects of all major taxes in the United States, estimated that marginal deadweight costs amount to from 17 to 56 percent of revenue raised. Jorgenson and Yun (1991) estimated that the post 1986 tax reform system imposed a marginal efficiency cost of 38 percent of tax revenue and an average efficiency cost of 18 percent of tax revenue. The greatest efficiency benefit of a revenue neutral APT tax is the elimination of distortions imposed by the current tax system that the APT tax is intended to replace. Further gains are the substantial cost savings assured by the improved efficiency of the APT assessment, collection and enforcement mechanisms that reduce administrative and compliance costs. As with any tax system, the APT tax introduces its own costs and distortions. Among the possible distortions we must include cascading effects on intermediary transactions that induce vertical integration; loss of liquidity in financial markets; a reduction in short term arbitrage transactions; a lengthening of the term structure of debt and the holding period of financial assets; reductions in asset valuations resulting from the capitalization of future APT tax liabilities; incentives to seek payment substitutes and off shore tax havens and the transitional costs of moving to a new tax system. Some economists1 have suggested that the painlessness of APT tax collection could also reduce public resistance to the growth in government – the Leviathan issue in public choice theory. The APT tax reform will create winners and losers. The greatest beneficiaries will be those whose current level of taxes are considerably reduced, primarily wage and salary earners with modest financial asset portfolios. Those most likely to perceive themselves as losers are individuals and financial institutions closely associated with the business of exchanging property rights in financial assets and those who sell advice concerning legal circumventions of the current tax system. Slemrod (1990); Bird (1992); Alm (1996) and Kaplow (1996) make clear that the design of optimal tax systems depend critically on considerations of administration, collection, compliance, and evasion costs. A new tax system that promises a radical reduction in these costs merits closer scrutiny. Under the APT tax proposal, the tax rate is reduced and the tax base is radically expanded beyond the conventional income tax base. First, all conventional deductions, exemptions and credits are eliminated. The base is further broadened by the inclusion of all voluntary wealth transfer exchanges of titles to assets and liabilities. DVd, measured as debits to all transaction accounts. The APT tax proposes to impose a fixed tax rate (t) on the total volume of after tax payments, (MV) such that the required tax revenue R equals the product of the tax rate and the total volume of payments. The APT tax system is designed as a single comprehensive alternative to existing income and consumption based tax instruments. Being revenue neutral, the flat tax rate is chosen so as to raise the same amount of revenues R as the current tax system that it is intended to replace. where the initial volume of payments, or the initial APT tax base is the before-tax volume of payments. As a first step, we must determine the required revenue R . Table 1 displays the source of United States tax revenues that the APT tax is intended to replace. In 1996, the two major sources of federal and state revenues were the income taxes (74 percent) and excise taxes (24 percent).3 The revenue neutral APT tax designed to replace federal, state and local personal and corporate income, excise, gift and estate taxes would have been required to yield tax revenues of $1,357 billion in 1996. The initial APT tax base consists primarily of debits to transaction accounts, namely accounts that permit the settlement of claims by check, wire transfer or direct debit. Debits and credits to financial intermediary and brokerage transaction accounts are routinely recorded as part of the necessary business accounting practice of firms. For fiduciary establishments they are the essential means for determining and maintaining the current status of customer accounts. As such, the collection and aggregation of debit statistics impose relatively minimal reporting burdens on the financial community. The Federal Reserve had regularly recorded debit statistics since 1918. Garvey (1959) observed, “Probably no monetary statistics released by the Board of Governors of the Federal Reserve System are more widely reproduced than the debit statistics.” Unfortunately, this valuable historic series was discontinued in 1996. We employ two estimates of the payments (MV). The first is the Federal Reserve’s debit measure that includes debits to all insured commercial bank demand deposits and to other checkable accounts.4 The second measure is the Bank for International Settlements (BIS) estimate of the value of total payments adjusted for double counting made with various payment instruments.5 To these estimates of paperless payments we add an estimate of the total volume of cash payments made with US currency.6 These time series estimates are displayed in Figure 1, which reveals that cash payments make up only 3 percent of total payments. The rapid growth of final payments is due to a reduction in transaction costs brought about by innovations in communications and information technology. Between 1980 and 1996 the debits payment estimates show a 6.5 fold increase and in 1996, the APT tax base was 98 times larger than the income tax base as measured by the Internal Revenue Service’s estimate of Adjusted Gross Income (AGI). Given an estimated initial APT tax base in 1996 equal to some $ 445 trillion, and a required level of tax revenues of $ 1,357 billion, equation (1) permits estimation of the lower bound of the revenue neutral APT tax rate per transaction, which equals 0.30 percent. Thus each party to a transaction would be required to pay an APT tax of 0.15 percent. Although most of our empirical analysis is focused on the United States, it is interesting to obtain a rough impression of the potential APT tax base in other highly developed economies. Even a low APT rate of approximately 0.15 percent for each buyer and seller will provide an incentive to economize on the volume of transactions. What is required is an estimate of the elasticity (h) of total transactions with respect to aggregate transaction costs. Despite the fact that we live in the information age in which the most dramatic technological breakthrough has been the drastic decline in transaction costs, transaction costs have only recently been incorporated into theoretical economic analyses. As yet we have no systematic means of empirically measuring and tracking aggregate transaction costs over time. At best, we may be able to measure transaction costs in some particular markets and examine the available estimates of the elasticity of transaction volume to transaction costs in those specific markets. As a first step we disaggregate the transactions side (PT) of the equation of exchange into those transactions associated with: (1) the production of final domestic goods and services. (2) intermediate goods and services. (3) international trade. (4) exchanges of real and financial assets. (5) transfer payments. Each of these transaction categories roughly corresponds with entries in a national accounting system, thereby providing a useful starting point for classifying available empirical information. The transaction categories (1)-(5)correspond respectively to the transactions associated with: Gross Domestic Product Accounts (GDP); the Input-Output Accounts (IO); the Balance of Payments Accounts (BOP); the Flow of Funds Accounts (FOF)8 and the transfer portion of the Government Receipts and Expenditures Accounts. Employing data from these macroeconomic accounting systems and from specialized trade sources allows us to provisionally inquire whether MV equals PT. Table 2 displays our attempts to estimate the volume of transactions from identifiable transaction components.9 We have been able to account for roughly 66 percent of the payment estimates. Missing transactions from the (PT) side include all transactions in existing real assets such as exchanges of real estate, raw materials, art and commercial enterprises as well as exchanges, purchases or repayments of financial assets and liabilities that are not included in readily available macroeconomic accounting sources. Of the $ 294 trillion measured transactions, the largest components are money-changing transactions10, foreign exchange transactions and bond market transactions, which together make up approximately 77 percent of measured PT. All equity, options and mutual funds transactions account for an additional 5 percent of estimated PT and final and intermediate goods transactions together account for roughly 11 percent. Economists should be concerned about the dearth of information concerning the source of more than a third of recorded payments. Perhaps this is a shortcoming that national and international statistical organizations can remedy in the future, but it is certainly beyond the purview of the present paper. 3.3.1 Equity market substitution effects. Our aim is to gain some insight into the extent to which initial total transactions are likely to decline in response to the introduction of an APT tax. Unfortunately, no one has ever attempted to estimate the elasticity of total transactions with respect to transaction costs, and so we must begin by examining research on trading volume effects in particular financial markets. The most careful, oft cited although somewhat dated estimate of the elasticity of equity trading volume to transaction costs in U.S. equity markets is (-.26) by Epps (1976). Jackson and O’Donnell (1985) estimate the transaction cost turnover elasticity on the London security exchange to be (-.70), while Lindgren and Westlund (1990) obtain an elasticity of about (–1.0) for the Stockholm stock exchange. Table 3 presents estimates of the total costs of executing equity trades by the largest institutional investors in Europe, Japan and the United States.11 Transaction costs for individual traders typically exceed the costs paid by large institutional investors. The table reveals that there exist wide disparities in trading costs for the large institutional investors in Europe. In 1999 these ranged from a low of 27.3 basis points in Germany to a high of 90.4 basis points in Luxembourg. 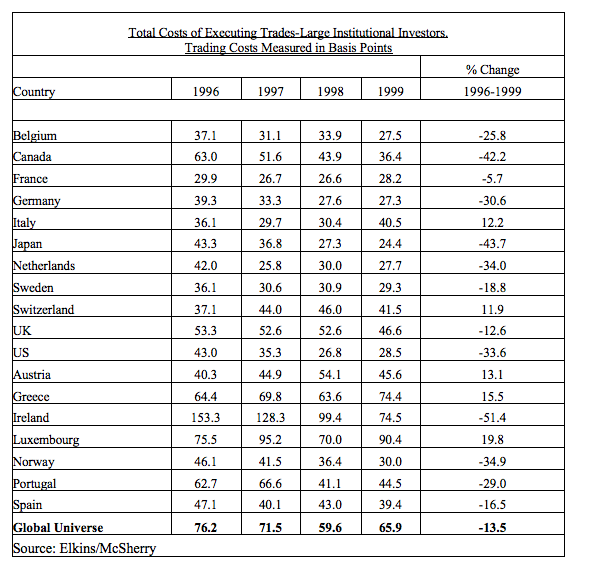 Since 1996, equity-trading costs have declined in many countries, sometimes in excess of 40 percent. Combining the transaction cost estimates reported in Table 3 and the aforementioned equity turnover elasticity estimates, we can simulate the equity market consequences of introducing an initial APT tax with a flax rate of 0.30 percent, that is a tax of 15 basis points for each buyer and seller in 1996. The simulated average percentage decline in equity trading volumes over all countries is 9 percent for the Epps elasticity estimate and rises to 33 percent for the Lindgren and Westlund estimate.12 Several factors suggest that the lower estimate is a more likely predictor of the actual consequences of introducing an APT tax. First, the primary determinant of elasticity is the number of available substitutes and there are fewer substitutes for all transactions than for any particular component of transactions. Therefore the elasticity for all transactions must be lower than the elasticity for equities in any particular market. Moreover, the aforementioned equity elasticity estimates were derived under circumstances where investors had many more substitution options than would be available under a universal APT tax. They could substitute taxed equities for equities traded in untaxed markets and they could shift their asset portfolio from taxed equities to any other untaxed asset.13 The breadth of the APT tax eliminates these substitution options and therefore implies a less elastic overall response. Continuing technology driven reductions in overall transaction costs and the elimination of existing taxes, particularly income and capital gains taxes, further mitigate the expected fall in total transactions resulting from the introduction of the APT tax. For example, consider a $10,000 equity investment yielding 8 percent per annum and held for 15 months, which was the average holding period for equities in the United States in 1998.14 Under an income tax system with a 30 percent marginal tax rate, the $1000 before tax earnings over the15-month period would be taxed $300 under the present system. Under an APT system with a 0.5 percent tax rate, the equity would be taxed $50 on purchase and $55 at the time of sale for a total tax cost of $110. The return on the average equity investment would be more attractive under the APT tax. The contrary would be true of bonds whose average holding period decline from 3.3 months in 1990 to 1.8 months in 1998. A $10,000 bond yielding an annual return of 5 percent and held for 1.8 months would earn $75 before the income tax and $68 after tax. Under the 0.5 percent APT tax the same investment would lose $25. In order to obtain the same return as under the present system, bondholders would have to double their holding period, that is reduce bond volume by roughly 50%. 3.3.2. Foreign exchange markets. The consequences of transaction taxes on foreign exchange (Felix, 1995; Spahn, 1995; Haq, et. al, 1996;) have been most widely discussed in the context of Tobin’s (1972) proposal to “ throw some sand in the wheels of speculation.” Annual foreign exchange volume in the US amounted to $ 67.3 trillion in 1996 and rose to $ 84.2 trillion in 1998. The volume of foreign exchange is made up of 42 percent in spot transactions, 11 percent in forwards and 47 percent in swaps. Perhaps 40 percent of this volume represents short-term trades of seven days or less. A 15-basis point APT tax on a security that turned over each week would amount to an annualized tax rate of roughly 15 percent; certainly enough to induce investors to substantially reduce trading volume and increase holding periods. Unfortunately, to date, there are no empirical estimates of the elasticity of foreign exchange trades that can be employed to obtain a prediction of the magnitude of the expected decline in foreign exchange volume. Felix, (1995) for example, assumes that a Tobin tax of 50 to 100 basis points would result in a reduction of 50 percent in trading volume. Since we have no firm basis on which to make such estimates, it is best to provide a sensitivity analysis that determines the revenue neutral required APT tax rate under different assumptions concerning the decline in overall transaction volumes. For the remainder of the paper, for illustrative purposes, we shall assume that total transaction volumes decline by 50 percent as a result of the replacement of the existing tax structure with a revenue neutral APT tax. This will require a uniform flat rate on all transactions of 0 .6 percent divided equally between the buyer and seller of each transaction. Each party to a transaction would then pay 0.3 percent of the transaction value to the government. In order to gauge the distributional impact of the APT tax, it is necessary to estimate the distribution of payments made by different income classes. 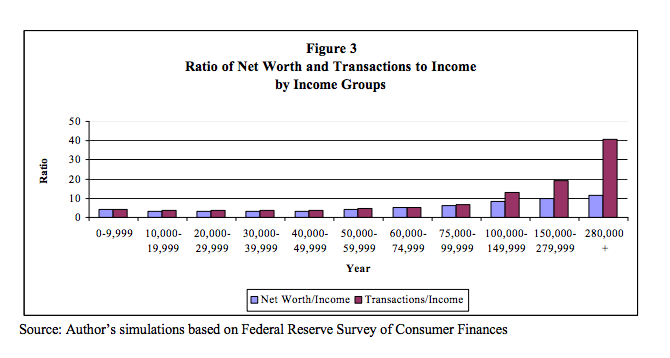 The strategy employed in this paper is to simulate the transactions patterns of U.S. households from their wealth composition as revealed in the Federal Reserve’s Survey of Consumer Finances. The 1986 survey contains estimates of the net wealth of households by income class and the composition of their net wealth by type of asset and liability. It also contains survey information on the number of times families in different income classes turned over particular assets. By applying turnover rates to each of the various asset and liabilities held in household portfolios of particular income categories, it is possible to simulate the volume of transactions (credits and debits) undertaken by households in different income classes. The Lorenz Curves reveal the highly skewed nature of the APT tax base. Since both net worth and total transactions are much more highly skewed than the income distribution, a switch to the APT tax will promote a progressive tax structure through the skewness of the tax base rather than through progressivity of tax rates. This claim cannot legitimately be made by any of the other flat tax rate proposals. 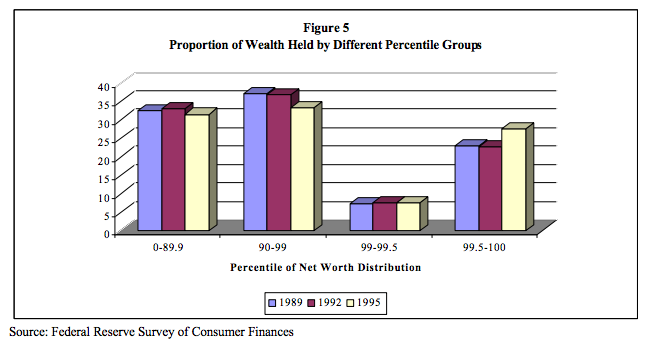 Figure 5 displays the wealth distribution by different wealth percentiles for different years of the SCF. In 1995, the first 90 percent of the wealth owning distribution owned only 30 percent of wealth whereas the top half of one percent of the distribution owned more than 25 percent of total wealth. The skewness in the distribution of overall wealth is also revealed when examining the distribution of the composition of wealth by particular asset categories.16 The distributions of particular asset categories display the same skewness as the distribution of overall net wealth and payments. Therefore, a flat tax on payments will assure equity even though all transactions are taxed at the same ad valorem rate. Final payments for any good, service, asset, liability or option is made with a final medium of exchange, typically currency and checkable or otherwise transferable deposits at financial institutions.17 Non-cash payments are evidenced by a debit to the deposit account of the payer and a credit to the deposit account of the payee. The transfer vehicle that gives rise to debit and credit entries may be a check, wire transfer, direct credit or debit, a giro transfer or a paperless credit transfer.18 The everyday operation of the modern financial system already requires the routine maintenance of exact records of account debits and credits to determine customers’ current balances. In practice, installation of the proposed APT tax revenue assessment and collection system would require the addition of a computer chip or a software modification to existing financial institution accounting procedures. The chip or software modification would create a virtual tax payment account (TPA) that is directly linked to every customer’s financial account. The linked TPA would be required to maintain a positive balance somewhat in excess of expected tax payments. Every debit or credit to the primary account would trigger a corresponding debit in the TPA account equal to the debit amount multiplied by the flat tax rate. This amount of assessed tax would be electronically transferred to the account of the government. All taxes are automatically assessed and collected at the time the transaction is consummated by payment. The TPA account serves to maintain the simplicity and symmetry of par banking, where every credit is offset by a debit of equal value. If I pay $20 for a book, my account is debited $20, the booksellers account is credited $20 and the taxes due are paid directly to the government from the TPA accounts. Every taxpayer has a private record of all transactions on which taxes were paid, but this record is not available to the government so as to assure complete privacy for the individual taxpayer. The government only has access to the TPA, which reflects the aggregate sum tax payments. The APT tax establishes an electronic real time system of instantaneous withholding for all payments. The present U.S. income tax system limits automatic withholding to taxes on wages and salaries. It requires the filing of quarterly returns and quarterly estimated tax payments for all other non-withheld sources of income as well as the costly filing of information returns by payers of interest and dividends. The APT tax collection system eliminates the need for all this paperwork. It is designed to complement the existing computerized payments mechanism, thereby minimizing the initial fixed transition cost of establishing an APT tax collection system. All tax systems are vulnerable to evasion when currency is made freely available to the tax-paying public. Currency is the preferred medium of exchange for illegal activities because it does not leave a paper audit trail. It is ironic, that government provides, virtually free of charge, the instrument most widely used to subvert both its revenue collection efforts and its laws defining prohibited economic activities. What is needed is a means of eliminating the incentive to use the state's own creation, currency, to thwart the state's fiscal objectives. The APT tax revenue collection system seeks to eliminate the free use of government currency to defeat its revenue collection function by imposing a tax on all forms of final payment, including cash payments. Since the administrative costs of policing currency transactions are clearly prohibitive, an explicit form of taxation must be devised for currency usage. One practical solution is to exact a tax on currency as it leaves and enters the banking system. The APT tax imposes a direct exit and entry tax on currency. In order to be effective, the tax rate charged on currency must be set higher than the rate automatically charged on check transactions. Indeed, currency should be taxed some multiple of the tax on check payments equal to what Fisher (1909, 1911) called "the cash loop". The cash loop is the average number of times that a unit of currency is used as a means of payment between the time it enters into circulation and the time it is returned to the banking system. Fisher (1909) estimated the U.S. cash loop as approximately two payments between withdrawals and redeposit and Feige (1987) estimated a cash loop for the Netherlands as approximately four payments. If the actual after tax cash loop is eight turnovers and the APT tax rate is 0.5 percent, a 2 percent premium charged on currency at the point of its withdrawal from banks, coupled with a 2 percent discount on currency at the point of its return to the banking system, is sufficient to equalize the marginal incentives to use currency and checks as a final means of payment. Individuals and firms requiring currency would have to purchase each dollar of currency at a premium of $1.02 and when currency is returned to the banking system it would be exchanged for deposit money at $ 0.98 per dollar.19 In order to distribute the added costs of currency usage, retail firms could charge a fee for payments made with currency in much the same way as they occasionally add a premium for credit card sales or presently offer a discount for currency purchases. The introduction of the APT currency tax could propitiously be combined with currency reform. In the year 2002, Europe will introduce the euro to replace the national currencies of the EU countries. The United States is presently replacing old U.S. notes with the newly designed dollar notes. Europe and the U.S. could therefore benefit from a coordinated program of currency reform and currency taxation. Disallowing exemptions and deductions, and assessing and collecting taxes automatically, eliminates the largest components of administration and compliance costs. There is no longer a need for individuals to file tax returns nor for firms to file information returns. The automatic revenue collection feature produces a real time taxpayer account that automatically provides every taxpayer with a transparent record of her direct tax payments. Thus, once the APT tax collection system is installed, the marginal costs of tax administration and tax compliance are significantly reduced. Enforcement costs will not disappear entirely since the fiscal authority must insure that there is no tampering with the installed system and maintain means to defeat counterfeit monetary payment systems. Pitt and Slemrod (1989) report that the direct annual costs of collecting the individual income tax in the United States amounts to between seven and eight percent of revenues raised. For the year 1982, they estimated the direct collection cost to be between $30 and $35 billion, with taxpayers spending approximately two billion hours to comply with the tax law. This amounts to a "hidden bureaucracy of one million full time civil servants." 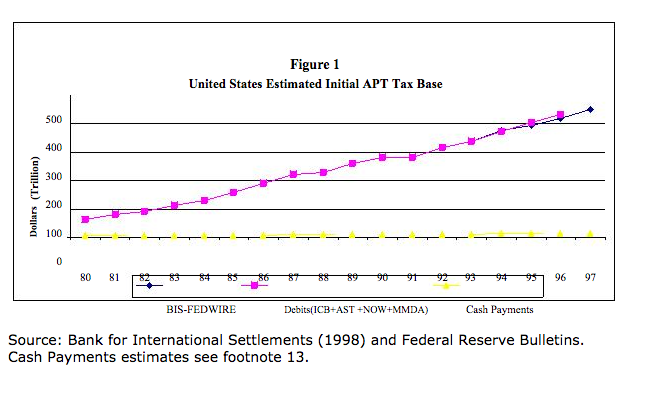 Extrapolation of these cost estimates to the current overall United States tax system suggests that total annual collection and compliance costs are well in excess of $100 billion [Blumenthal and Slemrod (1992); Slemrod (1995); Slemrod and Bluementhal (1996)]. Hall (1996) suggests an estimate of $200 billion. European tax systems also suffer from high compliance costs. In the United Kingdom, Godwin, (1995) observes “that the two largest revenue raisers, personal income tax and VAT, were also the most expensive taxes to operate, pushing overall operating costs of the tax system in the United Kingdom towards 4 percent of tax revenue”. Malmer’s (1995) study of tax compliance costs in Sweden concludes, “If costs are seen in relation to tax revenues, VAT is the most expensive of the major taxes.” In addition to being expensive, the compliance costs of the VAT have been shown [Sandford (1990)] to be highly regressive, with compliance costs for the smallest firms more than 200 times the compliance costs for the largest firms. The APT tax collection system eliminates the costs presently borne by individuals and firms in record and tax return preparation. By freeing firms and individuals from the onerous and resource costly task of determining their specific tax base, tax rate and tax liability, the APT collection system brings the marginal costs of collection and compliance down to the cost of electronic transfers of information. The low APT tax rate reduces the payoff from tax avoidance and evasion, while the automated assessment and collection feature raises the costs of these activities. The rapid expansion of Internet commerce poses special threats to the integrity of present tax collection systems. Under the APT system, Internet transactions that are paid by credit, debit or stored value cards pose no collection problem. Credit and debit card payments are taxed when the customer settles accounts with the card issuer and stored value cards are taxed when they are recharged with a debit to a financial account. Technological innovations such as the creation of anonymous forms of E-cash (digital cash) that represent a private digital substitute for the government’s present monopoly of issuing currency can raise collection problems even for an APT system. Such E-cash could cumulate and simply be transferred from party to party without returning frequently to the banking system. If anonymous private digital cash is permitted to substitute freely for government paper currency, it can function as a tax evasion vehicle. Private digital cash also deprives taxpayers of annual seigniorage earnings of the Federal Reserve that are now returned to the US Treasury. Given these concerns it behooves the government to issue its own E-cash that would benefit from the natural network externalities that now accrue to paper legal tender. Under the APT system, the creation of private inside money designed to evade taxes would be illegal and treated as would be any attempt to counterfeit legal tender. Voluntary exchange involves the acquisition, alienation or transfer of a present or future property right. A primary function of the state is to establish the monetary, legal, and protective institutions that provide the public services that facilitate, sanction, enforce and protect exchange, contracts and property rights over space and time. The new institutional economics literature teaches us that the establishment and maintenance of sound institutions may be the crucial determinant of whether a nation is wealthy or poor. The diffuse benefits from these institutional structures accrue to all potential transactors and it is therefore legitimate for the government to charge a brokerage fee to cover the costs of the social infrastructure that protects the property rights of the parties to every legitimate transaction. The state performs the essential and pervasive public service of facilitating and protecting exchange. From this perspective the state functions as the super-broker for the society. The APT tax can therefore be viewed as a comprehensive brokerage fee levied by the state to finance the panoply of services it provides. Most important among these are the maintenance of those institutions that protect and facilitate the acquisition and exchange of property rights. The consumption of these public services is evidenced by the act of exchange. When exchange is voluntary, every realized transaction represents a revealed expected net benefit to both the buying and selling party to the exchange. Moreover, every completed transaction reflects the revealed ability of both parties to pay for the exchange of property rights. Hence, both a "benefit" and an "ability to pay" principle operates to justify voluntary transactions as a legitimate base for taxation. If the expected gain from any potential trade exceeds the public and private costs of making the trade, the transaction will be consummated. Only those potential transactions whose expected marginal benefits are too small to cover the sum of private and social brokerage charges will be voluntarily aborted by private traders. The APT tax system assigns a distinctive role to the state as the public revenue collection agent. The state's role shifts from that of an active partner in the realized outcomes of the "game of economic exchange" to that of a disinterested ticket-taker. The state simply establishes the costs of admission to the game and then remains a passive spectator while potential market participants evaluate the expected gains and costs of engaging in exchange. The APT tax imposes an ex ante levy that amounts to a government brokerage fee to cover the entry cost for market exchange. Those who choose to participate in exchange bear the full ex post burden of mistakes and reap the full advantages of successes. The state's powerful, yet often unintended implicit role in resource allocation is sharply curtailed by excluding it from the spoils and losses of market outcomes. The APT tax eliminates all tax exemptions and tax credits. The history of past tax systems amply demonstrates the vulnerability of any tax system that permits exemptions, exclusions and credits, to the corrosive effects of rent-seeking special interest tax provisions on the tax base. According to Congressional Budget Office estimates, the revenue cost of tax expenditures amounted to $ 470 billion in fiscal 1996. Denying the revenue collection mechanism the role of allocating and redistributing resources through "hidden" tax expenditure preserves the comprehensibility and simplicity of the tax system as well as the integrity of the tax base. Moreover, the elimination of hidden tax expenditures forces public service provisions and transfer payments to show up as more transparent entries in the government’s expenditure budget. This makes the true level of government expenditures explicit and subject to direct political evaluation. Where constituent specific externalities can be identified and measured, explicit user fees and budgetary subsidies replace opaque tax expenditures. The APT tax design must also address the issue of fiscal federalism. State and local property taxes and user fees would continue to provide the same level of revenue as before since the APT is not intended to replace these revenue sources. State income and excise taxes are however eliminated and must be replaced through the APT tax system. The most direct solution would be for states to establish resident specific taxpayer accounts directly linked to the taxpayer’s federal TPA account. Every final payment would trigger both an automatic federal payment and a state resident payment. The states could therefore collect taxes electronically, either by a direct state APT tax levy or by a form of automated revenue sharing where the federal government would collect all the taxes and then redistribute revenues to the states in proportion to the debit payments of their respective residents. The transactions directly associated with the production of final goods and services, amount to roughly twice the GDP, reflecting both the income and expenditure sides of the National Income and Product Accounts (NIPA). The included transactions consist of payments to factors of production (income) and payments for final goods and services (expenditures). Although these transactions represent less than 5 percent of total transactions, they constitute the principal portion of the current tax base. The APT tax on payments related to the final production of goods and services amounts to a flat rate personal income tax (on wages and salaries; interest, dividends and rents), a flat rate corporate income tax and a differentiated expenditure tax. Output is stimulated by the effect of replacing the current income tax with an APT tax. The reduction of average and marginal tax rates on current taxable income from more than 30 percent to approximately 0.3 percent drastically reduces the present tax incentive to substitute leisure for work. Since the APT tax system permits neither personal deductions nor exemptions, it taxes all personal income sources at the same low rate, eliminating current distortions that favor some types of income while discouraging others. Aaron and Galper (1985) show that when fringe benefits are not taxed as part of employee income, firms have an incentive to provide such benefits even though their costs far exceed what employees would normally be willing to pay for them. Under the APT tax, firms have a tax incentive to reduce overall costs. Employees, whose marginal tax rates on wages and salaries are reduced from roughly 30 percent to 0.3 percent, have little incentive to over consume fringe benefits, choosing instead higher wages and salaries that can then be used to efficiently purchase health care and other retirement benefits. The effect of the universal transactions tax is to reduce and to equalize the tax rate on all forms of compensation, thereby eliminating the current over-consumption of those goods and services that have low before tax benefits but high after tax benefits. The lower marginal tax rates on income are likely to eliminate most of the supply side misallocation effects associated with the present personal and corporate income tax. Since the tax is on all forms of income, it also eliminates the current disparity between the withholding of taxes on wages and salaries and the non-withholding of other income sources such as dividends and interest payments. The APT tax fundamentally changes the incentive structure facing firms, consequentially altering the strategic rules of doing business. Present tax rates in excess of 30 percent are imposed on recorded income (revenues minus costs), whereas the APT tax rate of 0.3 percent is levied on the firm's total transactions (revenues plus costs). 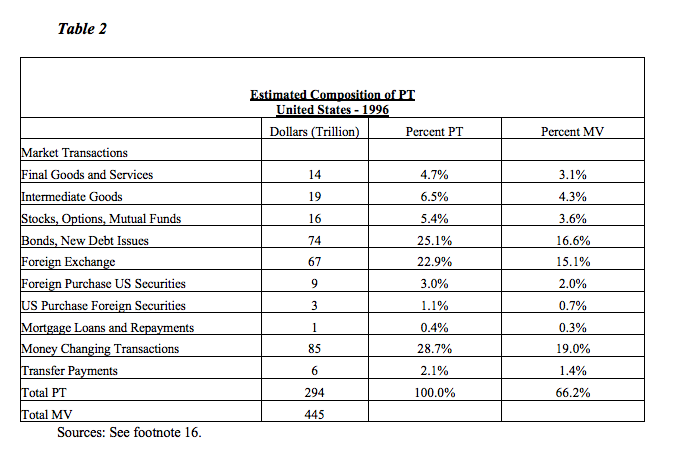 First, the turnover component of the APT will be small since as shown in Table 2, total intermediate transactions are estimated to make up less that 5 percent of total payments.25 Second, as long as the gains from specialization of trade are larger than the low APT tax rate, the APT will produce very little incentive for vertical integration. Finally, the proposed APT tax rate is so low compared to sales and VAT rates that APT replaces, that substantial cascading must occur before the allocation consequences of APT offset the benefits obtained from the elimination of excise and VAT taxes. The flat rate turnover tax component can be analyzed from the Coasian perspective of the industrial organization theory of the firm. According to Coase (1937), firms exist because many transactions are less costly within the firm than in the market at large. The turnover component of the APT tax will raise market transaction costs by increasing the spread between the buyer and seller price of intermediate products and hence provide a small incentive toward further vertical integration. While there are theoretical grounds for believing that some forms of vertical integration actually promote efficiency through reduced costs resulting from scale economies, vertical integration is traditionally seen as entailing welfare losses through higher prices and increased monopoly power (Rolph and Break, 1961). Vertical integration will however only occur when the gains from tax avoidance are greater than the gains from specialization. As a practical matter, it is doubtful that the APT tax will result in substantial vertical integration since in most cases, gains from specialization are likely to be large relative to the size of the APT tax. It is more likely that the APT tax will simply slow the trend towards vertical disintegration (McFetridge and Smith, 1988) brought about by growing markets that facilitate specialization. Present day technological advances in Internet business-to-business cost savings are likely over time to offset the incentive wedges toward integration produced by the APT levy. To the extent that vertical integration does result in the demonstrable establishment of monopoly power in any industry, conventional anti-trust policies can be employed to restore entry and market competition. Since the APT tax assesses both purchases and sales of intermediate goods and services, it is open to the criticism that the tax will cascade, and ultimately fall most heavily on goods that pass through multiple stages of production and distribution. The final net allocation consequences of a APT tax on intermediate transactions must be evaluated by juxtaposing the efficiency gains achieved by eliminating all retail sales, VAT, and corporate income taxes against the efficiency loss introduced by the turnover tax component of the APT tax system. The international transaction component of the APT tax is a variant of what has now become known as the Tobin Tax. Tobin’s (1978) concern arose from what he considered to be "the excessive international - or better, inter-currency- mobility of private financial capital" which has rendered national governments incapable of adjusting to disturbances in international financial markets "without real hardship and without significant sacrifice of the objectives of national economic policy with respect to employment, output, and inflation." (See also Tobin 1984; 1996). The advantages and shortcomings of taxing foreign transactions are extensively discussed in Haq, Kaul and Grunberg (1996). Eichengreen and Wyplosz (1996) point out that restrictions on international financial transactions have had statistically significant and economically important stabilizing effects. A modest ad valorem tax on international flows is unlikely to hamper international trade, being small compared to transportation costs and not exceeding the cost of using forward and future markets to hedge against currency fluctuations. The tax can actually improve market efficiency on second best grounds when asymmetric information, herd behavior, moral hazard or multiple equilibria give rise to market failures. An APT tax will not avert financial crises. It will however increase the costs of the speculative non-trade related currency portfolio shifts that have contributed to greater volatility in international financial markets. The tax partially offsets the past decade's innovations in financial and information exchange technologies that have significantly reduced transaction costs. These innovations have caused an explosion in the volume of transactions in foreign exchange that now exceed $475 trillion dollars per year worldwide. U.S. foreign exchange turnover in 1998 exceeded $ 84.2 trillion. The APT tax, like any other tariff, will produce some allocation costs. It will substantially reduce the profitability of presently untaxed short term trading that now characterizes the market for swaps and options. Since the relative importance of the APT tax decreases with the length of maturity of any financial contract, the tax will primarily affect the massive amounts of "hot money" transactions seeking to profit from the arbitrage possibilities created by minute international differentials. Unlike the Tobin tax26, which proponents see as a possible revenue source for international organizations such as the United Nations, the World Bank or the International Monetary Fund, the APT tax is automatically collected by the national tax authority in exactly the same manner as any other payment made through the financial system. Exchanges of property rights to real and financial assets make up a critical component of the APT tax base. The APT tax imposes a uniform excise of approximately 0.3 percent on the buying and selling parties exchanging property rights (or options to such rights) in newly created and existing equity and debt instruments - both public and private. This tax on transfers of financial instruments is the government brokerage fee that replaces all other existing taxes on capital gains and transfers. It is meant to pay for the provision of the costly institutional infrastructure that protects property rights and adjudicates contested claims under the established rule of law. No less than private brokers, the government is entitled to charge a fee to compensate for its costs of providing the services that facilitate trade. Like any brokerage fee, it naturally widens the spread between bid and ask prices. As long as the expected benefits provided to both parties to any potential trade exceed both the private and public brokerage costs, the transaction will be effected. From the social perspective, all voluntary exchanges of goods and services undertaken at prices that reflect the private and public marginal costs (including third party costs) of producing the goods or services are generally believed to be welfare enhancing since they allocate resources to their highest valued use. The same principle applies to exchanges of titles to real and financial assets. Asset exchanges represent the purchase and sale of valuable rights. They reflect the important financial innovations of markets for hedging and managing risk. However, under the present tax system, the brokerage fees charged for financial exchanges only reflect the private costs of providing them whereas the major burden of the cost of government now falls on the markets for goods, services and factors of production. This inequity is particularly egregious since the facilitation of asset exchanges requires costly government services even when the gains for the winners are exactly offset by the losses of the losers. From the social perspective, speculative exchanges by “noise traders” may induce third party externality costs that lead to negative sum games where the sum of aggregate losses exceed the sum of aggregate gains. Keynes' (1936, pp. 159-160) speculation argument for a transfer tax on asset transactions has not lost its salience today. Equity transfer taxes have been proposed by Summers and Summers (1989) and Stiglitz (1989) as a means of raising revenue and reducing speculative bubbles. Some financial economists [Kupiec, et. al. 1993] argue that such taxes can reduce stock prices, reduce the liquidity of financial markets, and actually increase volatility. While it is true that asset prices in perfect markets will decline by the expected discounted value of any additionally imposed tax, the models employed by Kupiec et. al. (1993) do not take account of the offsetting reduction in capital gains and corporate income taxes. Moreover, the elimination of capital gains taxation will also tend to add liquidity to the market by reducing the “locked in” consequences of the capital gains tax. A recent study by Odean (2000) demonstrates that overall trading volume in equity markets is excessive due to overconfident traders. Barber and Odean (2000) discovered that of the 66,000 households with accounts at large discount brokerage houses, those that traded most, earned an annual return 6.5 percent below the average market return. The APT tax increases the ex ante costs of trading for overconfident traders, but whether it is sufficient to dampen the volatility they cause is an empirical question. The APT transfer tax can and will be legally avoided by reducing the frequency of asset exchanges. The tax therefore provides an automatic incentive to lengthen the holding period of both equity and debt instruments. It will not compromise the attractiveness of temporal and spatial arbitrage opportunities whose expected returns are sufficient to cover the tax. The most likely reductions in exchange will occur in thoseshort-term speculative trades that attempt to capture small percentage returns to portfolios by getting on or off the "bandwagon" of what is believed to be current market psychology. Short-term “noise” trades can increase both volatility and risk. By increasing the cost of frequent trading of equity and debt instruments, the APT tax provides incentives for financial analysts to direct their talents to the search for fundamental long term high yield investments rather than design short term trading programs. Their compensation will result from larger investment management revenues rather than trade commissions from the churning of other people's assets. Summers and Summers (1989) have argued that the higher costs of frequent trade will also extend corporate management's investment horizons to pursue longer-term investment strategies and provide shareholders with greater incentives to monitor management planning and investment activities. The lengthening of the debt structure will reinforce these tendencies. The general equilibrium consequences of the APT tax on debt markets must also take account of the elimination of other existing taxes on wealth transfers. Debt will become more costly as the government will now charge a brokerage fee in much the same way as banks currently impose "points" for lending. The loss of deductibility of interest payments will discourage borrowing. Offsetting these disincentives are the reductions in income and inheritance taxes and the elimination of capital gains taxes. These offsetting reductions provide individuals and firms with greater after tax resources to service their debt repayments. The APT tax proposed in this paper is designed as a revenue neutral replacement for the present tax system. It is emphatically not intended as an additional source of revenue. It proposes to broaden the tax base by eliminating all implicit tax expenditures, all exemptions, deductions and credits while adding to the tax base the enormous volume of transactions representing exchanges of property rights to real and financial assets and liabilities. The flat rate tax required to maintain revenue neutrality is estimated to be in the neighborhood of 0.6 percent if total transactions volumes fall to half of their current levels. The APT tax system relies on an automated tax collection mechanism that insures that government revenues are immediately assessed and collected when exchanges are consummated by payment. The tax collection procedure relies on the technology of modern payment systems and obviates the requirement for individuals and firms to file any tax documents with government agencies. The state's role in tax administration is reduced to the oversight of financial institutions that provide depository, payment and clearing services. The introduction of virtual tax payment accounts that are electronically linked to existing transaction accounts provides each firm and individual with a transparent record of all tax payments. The standard business accounting practices, which currently require exact knowledge of all debits and credits to financial accounts, form the basis of the tax collection system. The addition of a tax on currency as it leaves and reenters the banking system eliminates the present anomaly of the government freely supplying a monetary instrument that is widely used to circumvent government statutes. The tax on currency and on automated payments increases the collection of taxes from illegal activities, including the traffic in drugs that requires heavy currency usage and repeated money laundering for the conduct of business. Tax avoidance is possible through barter transactions but the costliness of this form of exchange creates a natural economic barrier to its extensive use. We can certainly look forward to many financial innovations that attempt to reduce tax burdens through the introduction of new options and derivatives designed to expose a smaller volume of transactions to the APT tax. There will also be behavioral adjustments that substantially reduce transaction volumes by the judicious lengthening of asset and debt holding periods. Tax evasion cannot be eliminated but it can be greatly discouraged by powerful sanctions against the establishment of clandestine counterfeit payment systems and by denying any untaxed offshore transaction the protections of contract enforcement, dispute adjudication and connections to legitimate financial clearing/payment channels. The elimination of all exemptions and deductions along with electronic assessment and collection, reduces compliance and administrative costs, and discourages special interest political pressures to disassemble the all inclusive tax base. Base broadening however extends the effective tax base to include transactions involving intermediate goods and financial transactions. As such, the APT tax will produce cascading effects that disadvantage some goods relative to others. It may also provide incentives for vertical integration. However these are likely to be small relative to the offsetting technological reductions in transaction costs brought about bybusiness-to-business opportunities on the Internet. The APT tax will have its most significant effects on the exchange of equities, money changing transactions, debt and foreign exchange. Unlike the Tobin tax,27 the APT tax is intended to raise national revenues. It is not being proposed as a panacea for exchange rate or equity price volatility or as a means of promoting the autonomy of national macroeconomic policies. Nevertheless, as discussed, the APT tax system may benefit from some of the advantages claimed for security transaction taxes and for foreign exchange taxes. Models including “noise” traders do suggest that volatility can be reduced by a transactions tax. Critics of financial taxes [Kupiec, White, Duffee, 1993; Kiefer, 1990;] claim they reduce market liquidity, may actually increase volatility and will adversely affect asset values. An APT tax will have its largest effect on financial markets. The absolute value of its marginal tax rate is small, but it represents a large percentage increase in the costs of short-termexchange strategies in many financial markets. Many untaxed transactions that are profitable today will become unprofitable once the APT tax is adopted. Therefore we can expect a substantial decline in the volume of overall trading. Those who believe trading is presently excessive and possibly destabilizing will welcome this effect. Those who fear that such a tax will damage the effectiveness of markets in hedging risk, arbitraging discrepancies and allocating resources to their most highly valued uses in space and time, will argue that the advent of such a tax is very costly. To assess the desirability of the APT tax proposal we must weigh its perceived benefits against its perceived costs. On the benefit side of the ledger we must include all available empirical estimates of the total allocation, administration, compliance and evasion costs of the present system that the APT tax would replace. General equilibrium model estimates of the welfare costs of the current tax system [Ballard, Shoven, Whalley (1985); Jorgenson and Yun (1991)] suggest that its elimination could yield annual allocation benefits in excess of $250 billion. The elimination of tax and information returns could yield added compliance costs savings [Slemrod, (1990); Hall (1996)] estimated to be between $100 billion -$200 billion per year. To these savings we must add the reduced administrative and enforcements costs resulting from the unique automated collection mechanism of the APT system. The quantifiable benefits of eliminating the current tax system are therefore likely to range from $350-$500 billion per year. To these gains must be added imputed benefits of greater simplicity, transparency, and equity derived from the APT tax. Against these benefits we must weigh the costs of the new distortions the APT system is likely to introduce and the costs of transition. I have tried to make the case for my belief that the benefits are likely to exceed the costs by a substantial margin. Many details need further elaboration and investigation. We must learn more about the institutional complexities of domestic and international equity, debt and derivative markets and acquire better estimates of the extent to which transaction volumes are likely to fall in response to the imposition of the APT tax. Empirical evidence would be needed to support the claims that the allocation costs of cascading or loss of liquidity in debt and foreign exchange markets are sufficiently large to offset the allocation gains to be reaped from the elimination of the current tax system. We require technical specifications for the automated tax collection system and a transition strategy. Hopefully the seeds have been sown to suggest that these avenues of research are worth pursuing further. The distributive consequences of the APT tax system appear to be progressive since the tax falls disproportionately on asset exchanges conducted by wealthier citizens. The tax will however induce behavioral responses that are likely to diminish its initial redistributive consequences. Any further efforts at redistribution would have to be explicitly made through the application of government expenditures. Tax expenditure redistributions are not an option under the APT tax. It is therefore important that the design of the tax include a social monitoring mechanism capable of detecting the actual incidence effects of the tax. The tax does eliminate the present disparities between withholding of wages and salaries and other forms of income. Its comprehensibility and simplicity heightens taxpayer's perceptions of its fairness and uniform application and its transparency yields a clearer picture of true tax incidence. Several normative principles have guided actual tax reform policies. Most important among these are simplicity, equity, efficiency, and reduced costs of administration and compliance. To achieve these goals, politically successful tax reforms have incrementally restored the eroding income tax base by eliminating many loopholes and deductions and have lowered tax rates. Little progress has been achieved in reducing costs of administration, compliance and evasion. The state's revenue collection system remains a hodgepodge of individual and corporate income taxes; consumption and excise taxes; tariffs and inheritance taxes. No single coherent conceptual framework organizes the state's overall revenue collection function. The APT tax system seeks to provide such a framework by extending the logic of normative tax principles to all available tax instruments. The APT tax encompasses all prior taxes and subsumes them in the rubric of a singular tax structure. Revenue neutrality, base broadening, rate reduction, simplicity, transparency, equity, allocative efficiency and minimization of administrative and compliance costs are the principles that have guided the design of this apt new tax system. Aaron, H. (1989). ‘Politics and the professors revisited: Richard T. Ely lecture’, American Economic Review, Papers and Proceedings. Aaron, H. and H. Galper (1985). Assessing Tax Reform Brookings Institution, Washington, DC. Alm, J. (1996). ‘What is an optimal tax system?’, National Tax Journal. Atkinson, A.B. and J.E. Stiglitz (1980). Lectures on Public Economics, McGraw-Hill, New York, NY. Ballard, C.L., J.B. Shoven and J.Whalley (1985). ‘General equilibrium computations of the marginal welfare costs of taxes in the United States’, American Economic Review. Barber, B. and T. Odean (2000). ‘Trading is hazardous to your wealth: The common stock investment performance of individual investors’, Journal of Finance, forthcoming. Bird, R. (1992). Tax Policy and Economic Development, The Johns Hopkins University Press, Baltimore, MD. Blumenthal, M. and J. Slemrod (1992). ‘The compliance cost of the U.S. individual income tax system: A second look after tax reform’,National Tax Journal. Campbell, J.Y. and K.A. Froot (1994). 'International experiences with securities transaction taxes', in J.A. Frenkel (ed. ), The Internationalization of Equity Markets, University of Chicago Press. Coase, R.H. (1937). ‘The nature of the firm’, Economica. Eichengreen, B. and C. Wyplosz (1996). ‘Taxing international financial transactions to enhance the operation of the international monetary system’ in Haq, M., I. Kaul, and I. Grunberg (eds. ), The Tobin Tax: Coping with Financial Volatility, Oxford University Press, New York, NY. Epps, T.W. (1976). ‘The demand for broker’s services: The relations between security trading volume and transaction cost’, The Bell Journal of Economics. Feige, E.L. (1987). ‘The theory and measurement of cash payments: a case study of the Netherlands’ in R.D.H. Heijmans and N. Neudecker (eds. ), The Practice of Econometrics: Studies on Demand, Forcasting, Money and Income International Studies in Economics and Econometrics, Vol. 15, Kluwer Academic Publishers, Dordrecht. Feige, E.L. (1994). ‘The underground economy and the currency enigma’, Public Finance/Finances Publiques, and reprinted in G. Fiorentini and S. Zamagni (eds.) (1999). The Economics of Corruption and Illegal Markets, The International Library of Critical Writings in Economics, Elgar Reference Collection, Cheltenham,UK. Feige, E.L. (1996). ‘Overseas holdings of US currency and the underground economy’, in S. Pozo (ed. ), Exploring the Underground Economy, W.E. Upjohn Institute for Employment Research, Kalamazoo, MI. Felix, D. (1995). ‘Financial globalization and the Tobin Tax’, Challenge. Fisher, I. (1909). ‘A new method of estimating the velocity of circulation of money’, Journal of the Royal Statistical Society. Garber, P. and M.P. Taylor (1995), ‘Sand in the wheels of foreign exchange markets: a skeptical note’, Economic Journal. Garvy, G. (1959). Debits and Clearing Statistics and Their Use, Board of Governors of the Federal Reserve System, Washington. General Accounting Office, (1997). ‘Taxpayer compliance: Analyzing the nature of the income tax gap’, National Commission on Restructuring the Internal Revenue Service. Hall, A. P. (1996) ‘Testimony before the Ways and Means Committee of the U.S. House of Representatives’, March 20. Haq, M., I. Kaul and I. Grunberg (1996). The Tobin Tax: Coping with Financial Volatility, Oxford University Press, New York, NY. Internal Revenue Service (1988). ‘Income tax compliance research’, Supporting appendices to Publication 7285, Department of the Treasury, Internal Revenue Service Research Division publication 1414. Jackson, P.D. and A.T. O’Donnell (1985). ‘The effects of stamp duty on equity transactions and prices in the U.K. stock exchange.’ Discussion Paper No. 25, The Bank of England. Jorgenson, D. W. and K.Y. Yun (1991) ‘The excess burden of taxation in the United States’, Journal of Accounting, Auditing and Finance. Kaplow, L. (1996). ‘How tax complexity and enforcement affect the equity and efficiency of the income tax’, National Tax Journal. Kenen, P.B. (1996). ‘The feasibility of taxing foreign exchange transactions’, in M. Haq, I. Kaul and I. Grunberg (eds. ), The Tobin Tax: Coping with Financial Volatility, Oxford University Press, New York, NY. Keynes, J.M. (1936). The General Theory of Employment, Interest and Money, Harcourt Brace, New York, NY. Kiefer, D.W. (1990). ‘The security transactions tax: An overview of the issues’, Tax Notes. King, M and D. Fullerton (1984). The Taxation of Income from Capital: A Comparative Study of the United States, the United Kingdom, Sweden and West Germany, The University of Chicago Press, Chicago, IL. Research in Financial Services Private and Public Policy. London Economics (1999). ‘The impact of a reduction in stamp duty on UK equity transactions’, London Stock Exchange Report. Lindgren, R. and A. Westlund (1990). ‘Transactions costs, trading volume, and price volatility on the Stockholm Stock Exchange’, Stockholm School of Economics working paper. McFetridge, D.G. and D.A. Smith (1988). The Economics of Vertical Disintegration, The Fraser Institute, Vancouver, BC. Malmer, H. (1995). ‘The Swedish tax reform in 1990-1991 and tax compliance costs in Sweden’ in C. Sandford (ed. ), Tax Compliance Costs Measurement and Policy, Redwood Books, Trowbridge, Wiltshire. Musgrave, R.A. and P.B. Musgrave (1980). Public Finance in Theory and Practice, McGraw-Hill, New York, NY. Odean, T. (2000). ‘Do investors trade too much?’, American Economic Review, forthcoming. Owens, J.P. (2000). 'Is there a future for Tax Havens? ', Organization for Economic Co-operation and Development, May. Papke, L.E. (1989). 'International Differences in Capital Taxation and Corporate Borrowing Behavior: Evidence from the U.S. Withholding Tax', NBER working paper 3129. Pitt, M.M. and J. Slemrod (1989). ‘The compliance cost of itemizing deductions: Evidence from individual tax returns’, American Economic Review. Rolph, E.A. and G.F. Break (1961). Public Finance, The Ronald Press Company, New York, NY. Sandford, C. (1990). ‘The administrative and compliance costs of the United Kingdom’s value added tax’, Canadian Tax Journal. Slemrod, J. (1990). ‘Optimal taxation and optimal tax systems’, Journal of Economic Perspectives. Slemrod, J. (1995). ‘The simplification potential of alternatives to the income tax’ Tax Notes. Slemrod, J. and M. Bluementhal (1996). ‘The income tax compliance costs of big business’, Public Finance Quarterly. Spahn, P.B. (1995). ‘International financial flows and transactions taxes: Surveys and Options’, International Monetary Fund Working Paper WP/95/60. Spicer and Oppenheim (1988). Guide to Securities Markets Around the World, Wiley, New York, NY. Stiglitz, J.E. (1986). ‘Pareto efficient and optimal taxation and the new welfare economics’, in A.J. Auerbach and M. Feldstein (eds),Handbook of Public Economics, Vol. II North Holland, Amsterdam. Stiglitz, J.E. (1989). ‘Using tax policy to curb speculative short-term trading’, Journal of Financial Services Research. Stotsky, J. (1996). ‘Why a two-tier Tobin tax won’t work’, Finance & Development. Subrahmanyam, A. (1998). 'Transaction taxes and financial market equilibrium', Journal of Business. Summers, L.H. and V.P. Summers (1989). ‘When financial markets work too well: A cautious case for a security transactions tax’,Journal of Financial Services Research. Tobin, J. (1978). ‘A proposal for international monetary reform’, Eastern Economic Journal. Tobin, J. (1984). ‘On the efficiency of the financial system’, Lloyds Bank Review. Tobin, J. (1996). ‘Prologue’, in M. Haq, I. Kaul, and I. Grunberg (eds. ), The Tobin Tax: Coping with Financial Volatility, Oxford University Press, New York, NY. Umlauf, S.R. (1993). 'Transaction taxes and the behavior of the Swedish stock market', Journal of Financial Economics. Wilson, J.D. (1989). ‘On the optimal tax base for commodity taxation’, American Economic Review. Yitzhaki, S. (1979). ‘A note on optimal taxation and administrative costs’, American Economic Review. * Edgar L. Feige is Professor of Economics Emeritus, University of Wisconsin-Madison. Earlier versions of this paper were presented at the International Institute of Public Finance Conference on Public Finance and Steady Economic Growth, Buenos Aires, Argentina, August, 1989; the Congressional Budget Office, Washington, DC, September, 1993; the International Conference on Tax Administration, Institute of Public Finance, Zagreb, Croatia, June, 1999; the St. John’s University conference on “Taxation for the 21stCentury", New York, October,1999; the Central Bank of Croatia, Zagreb, November, 1999 and at the 31st Panel meeting of Economic Policy, Lisbon, Portugal, April, 2000. The author has benefited from the helpful comments and suggestions of conference participants and from Henry Aaron, James Buchanan, Glen Cain, Thomas Epps, Milton Friedman, Robert Haveman, Kai Konrad, and Charles Wyplosz. None of the above should be held responsible for the views or remaining errors contained in the paper. Mary Beth Wittekind performed the distribution simulations based on the Federal Reserve’s Survey of Consumer Finances. All correspondence can be directed to elfeige@facstaff.wisc.edu. 1Private correspondence with James Buchanan and Milton Friedman. 2Optimal tax theory models of the type employed by Wilson (1989) and Yitzhaki (1979) assume that administrative and compliance costs increase with the number of items included in the tax base. However, once all transactions are included in the base, the need to distinguish between them is eliminated and the cost of compliance and administration falls precipitously. 3The percentage calculations do not include contributions for social security programs, for state and local property taxes and user fees that the APT tax is not intended to replace. 4The debit statistics are the most reliable estimate of final payments excluding inter-bank clearings. They are derived from various issues of the Federal Reserve Bulletin and only include debits to demand and other checkable deposit accounts of individuals, partnerships, corporations and state and local governments. They also include cashiers and officers checks, but exclude debits due to banks, other depository institutions and the U.S. Government. As of January 1994, other checkable accounts (OCDs), previously defined as automatic transfer to demand deposits (ATSs) and negotiable order of withdrawal (NOW) accounts, were expanded to include telephone and preauthorized transfer accounts. Effective September 20,1996, the Board of Governors discontinued the Survey of Debits to Selected Deposit Accounts (IR2573). 5The Bank for International Settlements (1998) payment data do not correspond directly to the Federal Reserve’s debit statistics because they focus on payment instruments rather than final debits to the accounts of non bank transactors. As such they are a combination of debit statistics and net volume clearing statistics. We include the BIS statistics since they are the only payment data readily available for many European nations. BIS data for the United States include both the payments recorded by the Clearing House Interbank Payments System and their settlement of net debit positions through Fedwire. Our calculations for the United States exclude the Fedwire settlements to avoid a possible source of double counting. The BIS data also exclude “on us” debits, namely transfers of funds between accounts held at the same bank, but include various net inter-bank transfers. 6Estimated cash payments are obtained by multiplying currency in circulation outside of the banking system by an estimate of currency turnover. The velocity of currency estimate is obtained from a linear interpolation of benchmark velocity estimates obtained from the Federal Reserve Survey on Currency and Transaction Account Usage (SCTAU). Feige (1994; 1996; 1997) describes methods for obtaining the domestic volume of cash payments. 7The required tax rates would also depend upon the fraction of GNP comprised of government services in each nation. Since the fiscal burden of European nations is higher than that for the United States, the APT tax rate must be correspondingly higher. 8The Flow of Funds Account presently records only changes in asset holdings (net flows) rather than the gross transactions flows required for an adaquate accounting of the PT side of the equation of exchange. Our estimates of gross transaction flows must therefore rely on reports from trade organizations and security exchanges. 9Data sources include: US Bureau of Economic Analysis; US Office of Management and Budget, Federal Reserve Bulletin; New York Federal Reserve Bank; US Census Bureau; Internal Revenue Service; The Bond Market Association; US Securities and Exchange Commission; National Association of Securities Dealers; New York Stock Exchange and the Investment Company Institute. 10Money changing transactions include debits resulting from property rights transfers into and out of time and savings accounts, money market accounts; eurodollar purchases, repurchase agreements and sweep accounts. 11According to Elkins/McSherry, the reported cost of trades consists of three components: execution commissions, fees and a cost of trading effectiveness (a bid-ask spread) called “market impact”. It is the difference between the price at which a stock trade is executed and the average of that stock’s high, low, opening and closing prices during the day. 12The decline in equity volume on the Swedish exchanges was modest considering the large number of available substitutes for Swedish equities and the fact that the Swedish security transaction tax was as high as 2% between 1986 and 1991. The tax rate in this period was therefore roughly five times the expected APT rate. 13The APT tax will provide incentives for the development of options and other derivative instruments that permit more leveraged trade at lower transaction volumes. These incentives already exist in the financially sophisticated London Stock Exchange that presently has a stamp duty of .5% on equity transactions. Despite this high differential tax rate and the opportunity for avoidance innovation, the tax yields revenues of £2.5 billion per year, and London trade volume continues to grow dramatically. 14The average holding period is the inverse of the turnover rate. Assets valued at $1000 whose trade volume is $500 per year have a turnover rate of .5 and an average holding period of (1/.5) = 2 years. In 1990 the average holding period for equities was 24.4 months. The reduction in transaction costs has increased transaction volume and reduced the average holding period to 15 months. 15The distributions of income and net worth have been updated to include the data obtained from the 1995 Survey of Consumer Finances and are available upon request from the author. The more recent survey data do not change any of the substantive conclusions reported here. 16The disaggregated median value of family asset holdings for 1995 for bonds, stocks, mutual funds, retirement accounts, other managed assets and all financial assets can be obtained from the author on request. 17Credit cards are regarded as intermediate forms of payment since final settlement of the account requires a debit to the bank account of the cardholder and a corresponding credit to the account of the merchant. 18European countries rely on a highly centralized giro system for transferring funds among giro account holders. In a giro transaction, the payer will order the giro bank to pay specific sums to a number of payees. The payer’s account is debited and the payee’s account is credited in exactly the same manner as checking accounts in the U.S. are debited and credited. The difference lies in the fact that the giro system does not involve check-writing and therefore involves less paperwork. The giro system is particularly well suited for the administration of the APT tax system since it relies on highly centralized and automated paper-less fund transfers. The EU’s newly established wholesale payment system TARGET (Trans-European Automated Real-time Gross-settlement Express Transfer) consists of a real time gross settlement system for funds transfer that could also function as an electronic revenue collection agency. 19Once again, to maintain the symmetry of par banking, a dollar of currency withdrawn from an automatic teller machine would entail a debit of one dollar to the individual's bank account to cover the currency withdrawal and a $.02 debit to the individual's linked TPA account. An offsetting credit of $.02 would be transferred to the government's revenue collection account. 20Feige’s currency based estimated tax gap for 1997 was $159 billion with unreported income equal to 18% of AGI. 21The present marginal incentive to barter labor services is the income tax rate. The APT reduces this incentive from more than 30% to less than 1%. 23King and Fullerton (1984) found that effective tax rates of different investment categories ranged between 91.2% and - 21.5%. 24Turnover taxes provided the largest source of revenue for Germany for almost forty years, including the years of the "German economic miracle." In 1957, the turnover tax rate in Germany was 4%. 25An approximate estimate of the percentage of the APT tax base that represents intermediate transactions, and hence would be subject to the turnover tax component, can be attained from an analysis of the Input-Output (IO) tables. Based on a two- digit industry classification, I-O tables yield a ratio of intermediate transactions to final sales of approximately 1.3. Musgrave and Musgrave (1980) put the ratio of total intermediate to final sales at 2.5. We employ the higher Musgrave and Musgrave estimate. The growing importance of the service sector and the further reduction in intermediate transactions due to electronic business-to business Internet commerce suggest that the estimated ratio may be lower today. 26Tobin has suggested that the IMF Articles of Agreement could be amended to stipulate that implementation of the tax by national authorities would become a condition for Fund membership and borrowing privileges. Haq, Kaul and Grunberg (1996). 27See Felix (1995); Garber and Taylor (1995); Kenen (1996); Spahn (1995) and Stotsky (1996). 28Atkinson and Stiglitz (1980) conclude, "earlier analysis provides definite insights into the efficiency and equity arguments but leads to no clear presumption in favor of either expenditure or income taxation. It may well be therefore that the administrative aspects are decisive". Slemrod (1990) takes a similar view claiming, "that in its current state optimal tax theory is incomplete as a guide for action … for critical issues in tax policy", largely because it has failed to integrate the administrability and the technology of raising taxes into the normative theory of taxation. 29Henry Aaron (1989) laments the troublesome "dissociation between academic views and political debate on tax policy." Paradoxically, the political achievement of major tax reforms in the past decade has been guided by what Aaron calls "the old time religion of public finance” rather than by the new and often counter intuitive findings of the "new welfare economics".